Day 1of Induction programme of Batch 2015-18 was by the welcome address given by Chief Guest Mr. Makarand Khatavkar Group Head- Human Resources at Kotak Mahindra Bank followed by the presentation by Prof. Adya Sharma – Director, SCMS, Pune.On Day 2 - Ms. Renuka Mukadam, Consultant, SATHI – CEHAT, Pune and Ms. Asawari Abhyankar, Asst. 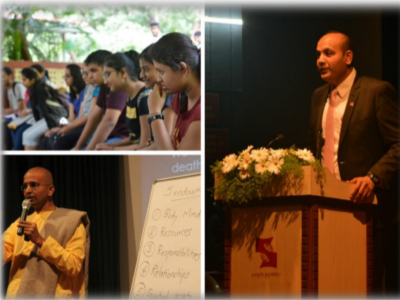 Prof, Symbiosis Law School, Pune delivered a workshop on gender sensitization. Mr. Nooh Khushal, Business Relations Manager – West, ACCA (Association of Chartered Certified Accountants) elaborated on the benefits and career prospects of achieving an ACCA certification followed by the introduction of enactus, club activities and sympulse. On Day 3 - Ms. Beena Mandrekar, Division Governor of Maharashtra and Goa, Toastmasters International spoke about “Public Speaking & Communication Skills” and Mr. Bal Govind Das, from ISKCON, Pune an expert in the field of synthesis of science and spirituality highlighted the topic Bha-Rata. On Day 4 - Students were taken to Dr. Babasaheb Ambedkar Museum and Memorial, SB road, Pune and Symbiosis International University Campus Tour. 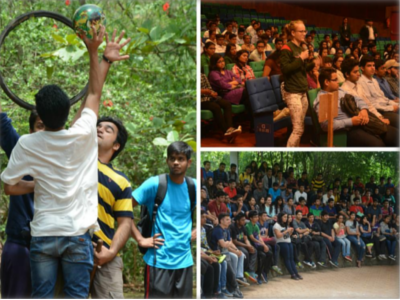 The Induction week was ended by a fun-filled outbound programme to Surya Shibir, Pune.